Each of these handy tips is tried and tested by Camper Trailer Australia readers. So, why not put some of these camp kitchen tricks into action on your next camping adventure? Russell Kruzychi from Blair Athol, SA, uses heat beads and a 30-year-old barbecue to cook with his camp oven when staying in fire-free zones. The barbecue is the perfect height, saving the Kruzychis’ backs, and it’s light and transportable to boot. Upgrade your fragile foods to first class by storing them in egg cartons: the perfect vessel for temperature-controlled transportation. The success of this method relies on optimal dimensions – Roma tomatoes make the perfect ‘cackleberry’ companion. If you plan on making your dinner over an open fire you are going to need firewood. 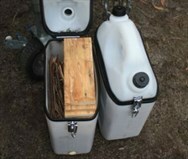 Bruce Ninnis from Oakleigh, Vic, adapted jerry cans so he could carry his firewood in the holders – an otherwise wasted storage space on the trailer. Slice open the top of the jerry can and attach a hinge on one of the sides and a latch on the other. Add car seals on the sharp edges of the container where you made the cuts, as this helps to keep the contents dry and ready for use. David and Jan Cook wanted a customised windshield so that their camper cooktop retained enough heat for hassle-free cuppas in the wind. David made a three-piece cardboard template to suit the dimensions of his camper stove and engaged a local aluminium fabricator to create the screen. Two aluminium sheets fit down the side of the stove and against the lid. David secured a third, smaller piece low enough to fit across the front of the cooktop, beneath the pots and pans with two self-tapper screws. The corners were rounded and the sharp edges filed away to prevent cuts and scratches. This traps heat and makes the stove much more efficient, especially in the wind. Terry Agland from Windsor Downs, NSW, rescued an old burnt out camping toaster by welding stainless steel mesh to the frame. The modified toaster has lasted many years and performs extremely well as it evenly distributes heat. Adam Craze from Mordialloc, Vic, has fitted pop-up 240V power points to his camper trailer benchtop. When not in use the points drop flush with the bench. Handles raise the points when required. The 240V sockets are powered through the inverter. Russell Dent from Sale, Vic, manufactured a neat stable table using the wheel arch guard of his camper trailer. The table top is braced by two supports, held in place by bolts and wing nuts. The construction allows the table to be quickly assembled and secured to the guard. Eat your camp dinner in peace.